This frog keychain makes a ribbit sound and its mouth flashes a blue LED light when the button on its back is pressed. These are great for party favors or just for frog lovers of all ages.Frog keychain makes ribbit sound and flashes LED light when button is pressed.This frog keychain makes a ribbit sound and its mouth flashes a blue LED light when the button on its back is pressed. These are great for party favors or just for frog lovers of all ages.Frog keychain makes ribbit sound and flashes LED light when button is pressed.This frog keychain makes a ribbit sound and its mouth flashes a blue LED light when the button on its back is pressed. 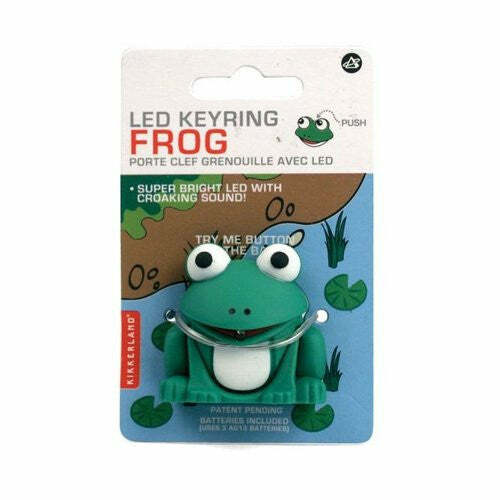 These are great for party favors or just for frog lovers of all ages.Frog keychain makes ribbit sound and flashes LED light when button is pressed.